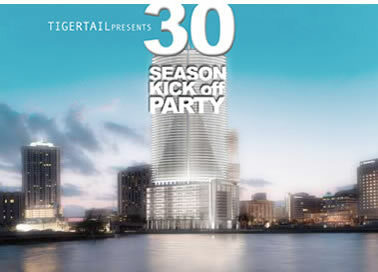 Come to Tigertail's 30th Season of Art and Soul Kick-Off Party at the chic, new, urban, River Lounge in the Epic Hotel (former Dupont Plaza location). We are known for our memorable parties. Come and preview our upcoming events, enjoy music by Boise Bob and His Backyard Band featuring Clifton Childree, video, spoken word by members of Tigertail's WordSpeak Team, a special appearance by the Miami Poetry Collective and complimentary drinks, while taking in the dashing view of the Miami River, Miami Circle and Biscayne Bay.